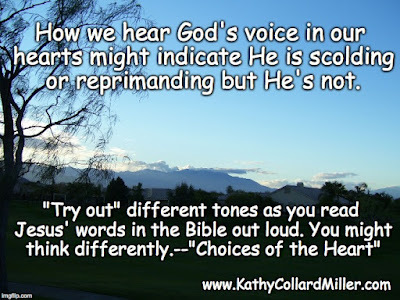 What is Jesus’ Tone of Voice? Rebuke or Wooing? Remember Martha and Mary? Of course we all do. And remember Jesus’ words to Martha? “Martha, Martha, you are anxious and troubled about many things, but one thing is necessary. Mary has chosen the good portion, which will not be taken away from her” (Luke 10:41-42 ESV). How do you hear the tone of Jesus’ voice? Is it a harsh rebuke or a gentle wooing? I’d like to suggest it’s a gentle wooing. How we hear Jesus’ voice in our hearts can indicate a lot. Tweet that! Maybe we were scolded more than praised as a child. Maybe we grew up thinking we didn’t deserve any praise, and we only expected to be reprimanded and not acknowledged for our efforts. You might want to “try out” different tones as you speak Jesus’ words out loud. What emotion does a soft and encouraging tone bring up inside you? Also, try to say Jesus’ words with different words to communicate several possible meanings. I’m confident that Jesus’ words conveyed love along with His body language. How do you picture His eyes? Was he leaning forward to reach out to her or pulling back? Pay attention to how you envision the scenes in the Bible as you read. It might be helpful to picture something different. Absolutely love the suggestion to pay attention to how we envision scenes. I'm thankful for the wooing voice of God especially during times when I needed it the most.